Since the recordings of Donald Sterling’s rants dropped Saturday, we’ve all been inundated with tales of how dedicated he was to his antiquated world view, to the tune of the largest housing discrimination settlement ever obtained by the Justice Department. More and more, as these tapes bled over into mainstream news, more racist quotes attributed to him covering his entire time as an owner in the NBA were made known, and public sentiment has turned even more violently against him. Hell, even Michael “Republicans buy shoes too” Jordan weighed in on the situation, and his reluctance to take stances on social issues is legendary. The pitchforks around Sterling are growing in number, and Adam Silver’s press conference today will be watched and analyzed by everyone from ESPN to Lifetime (probably not Lifetime). My only question is: why now? Intellectually, I understand why now. TMZ, which has curiously emerged as the go to reliable source for breaking news, sparked the current inferno, but why didn’t more people know about this. Chad Floyd and I were roommates about three years back, and a running joke around our house/condo/death trap upon hearing anything terrible in the news was that it was somehow Donald Sterling’s fault. It was my assumption that everyone followed sports as closely as we did, and that this was common knowledge. But as I talked to people – SMART people – over the last few days, it became readily apparent that indeed, Sterling’s long and storied history of douchebaggery had eluded the general public. Was this a concerted effort by David Stern in hopes that the old man’s idiocy could be ignored until he died? Probably. Was it the 29 other owners (all of whom are less tenured than he) regarding him as an embarrassing member, who weren’t really surprised by his comments? Apparently. Did buying his way into an NAACP Lifetime Achievement Award in 2009, even when he was embroiled in a discrimination lawsuit with NBA Legend Elgin Baylor help smokescreen EVERYTHING else? Quite well, thanks for asking. 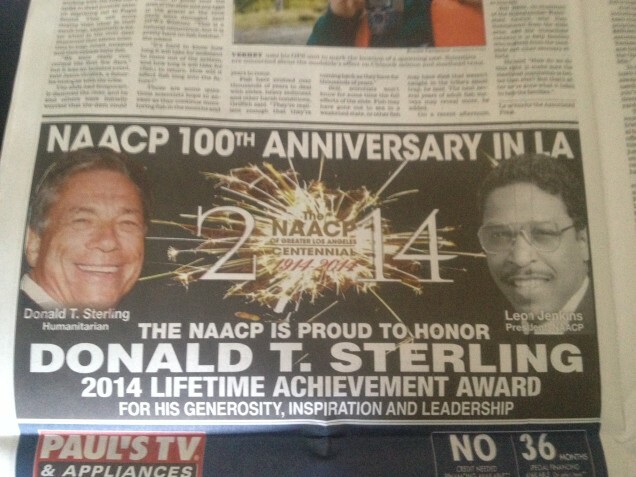 So well, in fact, that the LA Chapter of the NAACP was ready to give him a second Lifetime Achievement Award (two lifetimes?) until this story broke. So now, the question being bandied about is what does the NBA do to punish Sterling. It’s an interesting question, if not only because he’s a racist dickbag, but also because he is objectively the worst owner in professional sports over the past thirty years. Seriously. From 1981, when he bought the team, the Clippers have generated the lowest winning percentage of any of the four major professional sports in America, but it never mattered to him, because he was making money hand over fist. There have been some owners who are taking an admirable stance that he should be expelled from the league, but others are advising caution for a number of reasons. I am interested to see what Silver and the NBA CAN do because 1. I am not a lawyer (sorry Mom!) and 2. the NBA constitution is a secret document. Let’ say the NBA is able to force him to sell, an option I think is NOT on the table, and look at what the whole situation: He bought a bad team for $12.5 million, and the most recent sale of a bad team in the NBA was of the Bucks this spring for $550 million. If he is forced to sell, look for the Clippers to earn him WAY MORE than $550 million. The Clippers have advantages over the Bucks in star players (Chris Paul and Blake Griffin), facilities (Staples Center), winning culture (consecutive playoff appearances), and location (not Milwaukee). So, even if they take away the team, this man walks with TONS of money. TONS. And no real incentive to address his beliefs and actions that have been designed to systematically oppress people for years. Bomani Jones wrote this nine years ago, and it got more reads yesterday than it has since it was posted. Nothing he said became more true, people are just now paying attention. Chad and I joked about the lunacy of Donald Sterling three years ago partially because tragedy + time = comedy, but it’s harder to laugh now that people know and are just focusing on the audio recording made by his mistress who is being sued by his wife for embezzlement. And by embezzlement, she means the fact that Donald gave his mistress over $1.2 million dollars in gifts and money. I hope this leads to a larger conversation about the culture that Sterling espouses, but this is America and talking HONESTLY about race makes everyone uncomfortable, so probably not. FWIW, I’m calling indefinite suspension, and a 5 million dollar fine. Book it. Daniel Palmer (@dpalm66 on the Tweets) leads Chad Floyd (@Chad_Floyd) and Andrew Hall (@DudeYouCrazy) on a guided tour of the week in sports including: a college football union vote, the NBA Playoffs, NFL postseason expansion and Pine Tar. Be sure to download and subscribe to the podcast on iTunes here. Stream online via Spreaker, or check it out on Stitcher Radio. Georgia Football: How Important is Securing the State’s Borders? I wrote a bit on this topic for Bleacher Report last week, but a number of respectable counter-arguments have been made. Most notably, does it matter where talent comes from if that talent is ready to produce at the collegiate level? In theory, no. But I still have a hard time openly embracing the Peach State’s best players leaving the Bulldogs behind. According to 247Sports, Georgia currently has the no. 16 class in 2015. It’s early, but no Dawg fan wants a class ranked that low. A big reason for that slide is the lack of dominance in the home state. Here’s how that same recruiting service projects the best players in the state. The seven players above have composite rankings in the nation’s Top 50. One is committed to Georgia. One is considering—and possibly favoring—Georgia. Five are committed elsewhere. Deadspin continues to drive nail after well-written nail into the coffin of the NCAA. 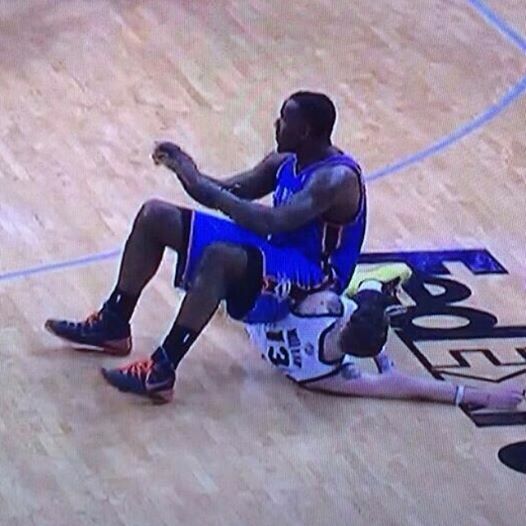 Related: let’s wish Jason Smith a happy birthday. He’s pretty good at this here blogging thing, and he hates the NCAA too. Read his stuff here, or follow him here. Westbrook hits a 500 foot three pointer to tie. Grizzlies respond by calling three tight end formation and power run to right. Somehow, Memphis withstood all this and won 98-95 in overtime, taking a 2-1 series lead and making one wonder: WHAT IF THE THUNDER HAD ANOTHER CAPABLE SCORER?